Mount networking, telephone, VOIP equipment, routers, switches and more with the R4 Series Four Post Open Frame Rack! Material: Steel Mounting: Horizontal EIA compliant 19" four post open frame rack shall be Middle Atlantic Products model # R4CN-4530B. 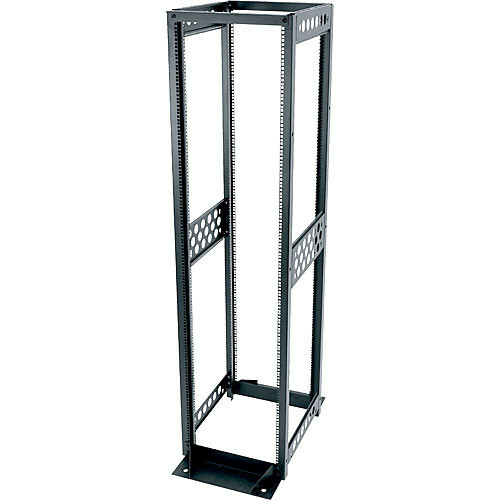 Overall dimensions of rack shall be 84.22" H x 21-1/4" W x 42" D with 45 useable rackspaces. Rack shall ship unassembled. Rack shall provide a static load capacity of 2,000 lbs. and a UL listed load capacity of 800 lbs. Rack shall accept equipment mounting using cage nut style hardware. Rackrail shall be 14-gauge steel. Top, middle and bottom side brackets shall be 16-gauge steel. Base angles shall be 14-gauge steel and shall mount outward for increased stability or inward to conserve floor space. Weight capacity shall be 1,000 lbs. Rack shall be finished in a durable black powder coat. Open top shall accept mounting of optional cable ladder. Rack shall feature zero-U mounting capabilities for optional cable lacing strips, vertical power strips and cable ducts. R4 rack shall be UL listed in the US and Canada.